AMCL has been working since 2006 on defining and measuring Network Rail’s Asset Management capability in its role as Independent Reporter (Asset Management) to the Office of Rail Regulation (ORR) – the economic and safety regulator for the GB rail industry – and Network Rail. The key objectives of the process were to determine the maturity of Network Rail’s Asset Management capability, using contemporary best practice as a framework, and to subsequently allow the ORR and Network Rail to identify and agree improvements to this capability that were both challenging yet realistic. AMCL’s AMEM was the maturity model used to achieve this. 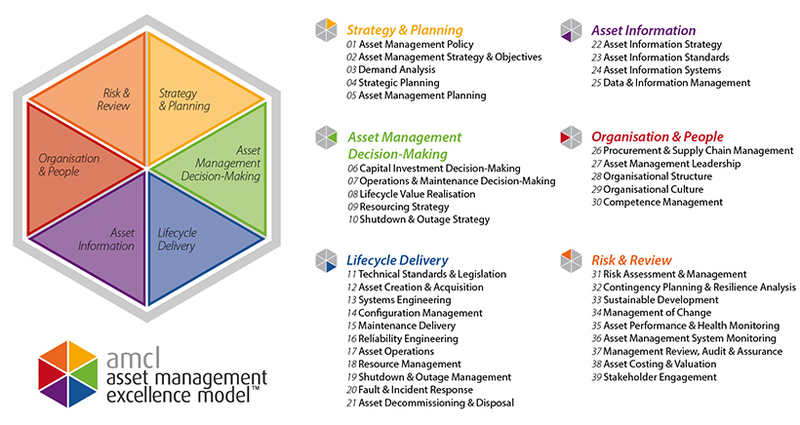 AMCL was also commissioned to develop a comprehensive Asset Management Roadmap which considered best appropriate practice, organisational context, timescales and constraints. In turn, Network Rail developed a detailed Asset Management Improvement Programme (AMIP) to deliver the Roadmap. The AMIP set Network Rail’s priorities for Control Period 4 (CP4) which ran from 2009 until 2014. Three additional AMEM assessments were scheduled to coincide with key milestones during the Control Period. The overall outcome (i.e. the overall Asset Management maturity score across the six-groups of the AMEM model) for Network Rail was tracked against a trajectory, based on AMCL’s Roadmap and jointly agreed by the Boards of ORR and Network Rail. Armed with a clear view of improvement opportunities, Network Rail was able to focus on the areas that were of most importance to its particular context and its responsibility to be able to justify £37bn of expenditure during CP5. This understanding has been used by both the ORR and Network Rail to review existing Asset Management improvement projects, better justify that expenditure plans are robust, sustainable and efficient and to establish clear, quantified and continually challenging but realistic targets for improvements in Asset Management capability. A critical foundation for achieving economic and sustainable output performance. Looking forward, AMCL will continue to support Network Rail in its Asset Management activities and improvement programmes; both across the overall network and within each of the eight devolved Routes. The AMEM has also now been adopted by Network Rail and the ORR as part of the formal regulatory framework for the current CP5.